This past week was a mixed bag of weather with wind, rain and some really bright sunny days. This weekend the forecast for both the Strait of Georgia and Howe Sound looks decent, with light winds forecasted for Saturday, and some NW winds for Sunday, and northerly outflow forecasted for Howe Sound. We are in the usual January/February weather pattern of consistent winter fishing where if you put in the time you are usually rewarded with a few nice chinook. As always, using glow flashers and spoons, and keeping your gear close to the bottom is the way to go. If you are looking for a few go to combos this time of year I would recommend the following. A chartreuse glow flasher such as UV chartreuse/glow (such as Salty Dawg, BC, Chartreuse Phantom, Chartreuse PA Custom, Green Onion Glow) with a 6-foot leader to a 3.0 or 3.5 Kingfisher Irish Cream spoon or a Skinny G or G-Force in similar colour. The other is a UV purple/glow flasher or a black/glow flasher (such as Purple Phantom, Purple Onion Glow, Purple Kinetic with Glow Stripe, CB-55, Black PA Custom) with the same size spoon in Herring Aide or Cookies n Cream or a Skinny G or G-Force in similar colours. These are some of our favourites and if you have one of each down, you can’t go wrong. You can fine-tune your choices from there as the fish tell you what they want that day. Some of our favourite spoons and flashers for this time of year. There are fish well spread out through Howe Sound and good numbers in the Gulf Islands as well, so there really is no one hot spot. All the usual spots have produced for us for many weeks now, so when our guides pick a spot to fish this time of year we always take a good look at the fishability for that given day. By that we mean how effectively we can fish it depending on what the tides and winds are doing as boat positioning and speed are critical to success. It makes no sense to go to a “hot spot” if the wind is constantly pushing you out of the zone and making you go to fast, or the tide is not the most productive for that spot. So the “hot spot” often ends up being the spot where our guides are going to have the most control of the boat that day and in the end that means more hook-ups for our guests. A chinook feeding on some herring trying to hide on bottom. Crabbing continues to be slow, we have dropped traps on some trips lately, but the majority of crabs have been just undersize. Prawning has been solid for the winter season thus far, and we are dropping traps on all of our 8-hour trips. If you are heading out in your own boat, make sure to read the regulations before you set your gear to ensure you are not setting in a protected area such as a Sponge Reef Closure. If your map card is updated it will show these areas with an orange dotted line. If you don’t have a chart plotter on your boat, download the Navionics app on to your phone and you can see all the Sponge Reef Closures and RCA (Rockfish Conservation Areas). Ronnie hooked up on a nice How Sound spring. 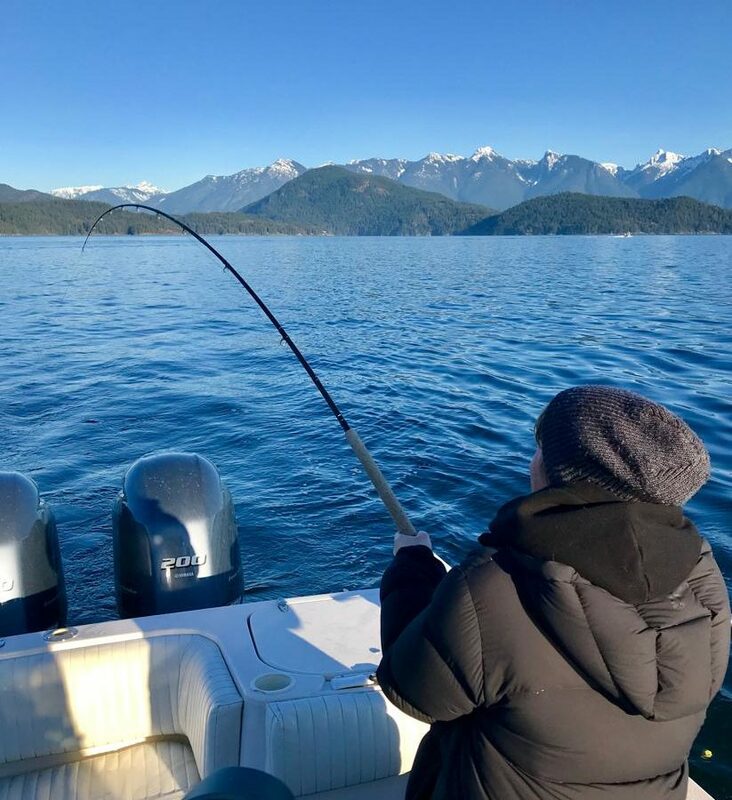 If you are looking for a charter, we are running our usual “Winter Chinook Special” until March 31st, where we offer an 8-hour charter at $799 for 1-2 guests, $899 for 3-4 guests, and $999 for 5-6 guests. If you want to get out on the water for chinook and prawns and take advantage of this special, please give me a call at 778-788-8582.